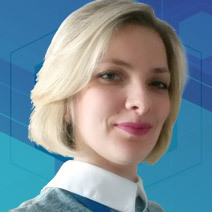 Since 2008 Yuliia has been working at the National Scientific Center “Institute of Metrology” as one of the main engineers in the laboratory of space-time measurements. In 2012 she graduated from the National University, she is engaged carrying our calibration on the coordinate measuring machine, calibration and calibration surveying equipment. Yuliia studied calibration methods of coordinate measuring machines as the most cost-effective, in accordance with the requirements of consumers.